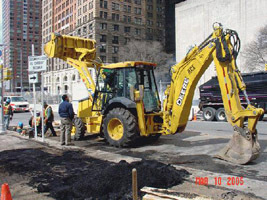 Metro Transit Authority construction site, Manhattan, New York City. John Deere 710G backhoe. A diesel particulate filter was required to meet local standards for particulate reduction. It was also necessary that the emission control device be installed such that it would not obstruct the line-of-sight of the vehicle operator. DCL custom designed a diesel particulate filter to install in the same envelope as the original muffler, so that the particulate filter remained inside the engine compartment. 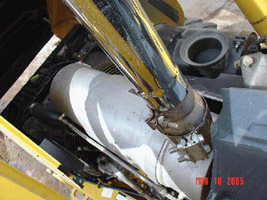 The diesel particulate filter was delivered to the customer in less than three weeks and it was installed in less than four hours in February 2005. With the vehicle operating on ultra-low sulfur diesel fuel, the unit works as a passive system without the need for regular cleaning. In addition to a particulate reduction of over 90%, the noise level is lower than the original muffler.